yesterday's review of team sky's 21 days to glory and the previously reviewed allez wiggo would lend themselves to proving that there is an eager market for the visual aspect of cycling. though lionel birnie has now proffered the completely unillustrated cycling anthology, books such as herbie sykes' coppi and a third edition of michael barry and camille mcmillan's le metier gives credence to the theory that 'a picture is worth a thousand words.' perhaps our need for instamt gratification has made the effort required to read lengthy regions of the printed word more than the modern consumer of cycling ephemera and paraphernalia is willing to expend. if true, it's surely something of a dichotomy? the advent first of heart-rate monitors and subsequently the almost ubiquitous power meter has led even the most reticent of sportive cyclists ready and willing to expend inordinate amounts of energy on the bicycle. this may be down to perceived peer pressure and the need for bragging rights in the coffee shop. it is conceivably something of an embarrassment to be outdone by a matter of several dozens of watts by someone you know you can outrun in the speed limit sprint. nobody is ever going to show you their srm print-out, meaning that months must be spent training in the search for numerical superiority. reading has no bragging rights, and is probably not even discussed over froth. however, such is the march of technology that books were usurped by radio, the latter in turn by television (allegedly) and ultimately by the internet. drawing and illustration is most certainly a lengthier and more taxing method of illustration than clicking a camera shutter, but the advent of youtube and vimeo suddenly presented the opportunity for still images to be replaced by moving pictures. these were, by definition in the early days, somewhat rudimentary, partly due to the cameras on offer and almost certainly by the former state of editing software. 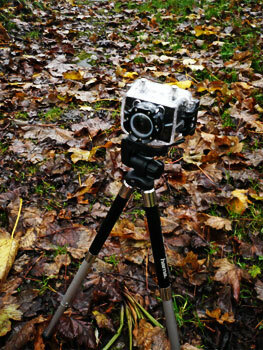 the march of technology however is scary, and those ever so slightly fragile video cameras of yesteryear (flip?) are currently being replaced by more rugged examples that will shrug off the conditions that often threaten to halt the personal movie business in its tracks. one of the most recent entries to the market for such is the bizarrely named 'foolish' hd action video camera from nilox. 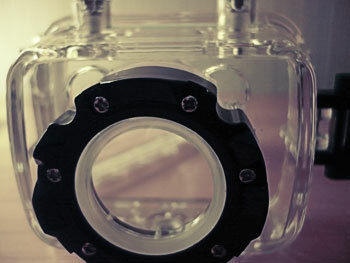 in keeping with its competitiors in this emerging market, the camera resides inside a clear, toughened plastic watertight case, allowing most operations to be carried out in water depths of up to 60 metres. thankfully, there are few cycling circumstances that take place at such inordinate depths, but at this time of year in particular, dry days are often few and far between, so a camera that can shrug off the elements as easily as those riding bicycles is certain to be welcomed with open arms in certain quarters. the basic foolish starter kit consists of the camera capable of full 1080 x 1920 hi-definition recording and 4 x digital zoom as well as 8mp stills capability (3200 x 2400 pixels), a removable lcd panel, two waterproof cases (one for the camera with lcd and one without) rechargeable battery, 8gb micro sd card and a mount or two. uk distributors windwave kindly sent along a chest harness allowing on the bike filming, and a handlebar bracket for fore and aft filming. additionally, everything needed for charging the battery and transferring files is also included. the camera is simplicity itself to operate, which is just as well because the enclosed intruction manual verges upon the obscure. 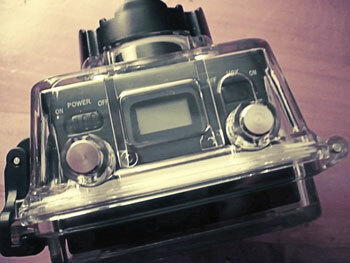 topside are two buttons, one for recording and one for taking stills. there's an on-off button as well as one to switch audio recording on and off and a very small lcd panel to indicate what's going on. although it's possible to accomplish basic setup via this panel, unless you have really good eyesight, i'd recommend fitting the lcd back panel and carrying out everything via the colour screen. it's quite simple really. there's a convenient red light on the top to indicate that recording is taking place, the latter activated by a spring-loaded button on the top of the waterproof casing. a separate button allows for stills. there's no doubt that a movie of any length benefits from a modicum of pre-planning, and though the camera lends itself well to being switched on to simply record any action that might be taking place, non-linear recording and editing often makes for a more pertinent end result. in order to properly review the nilox 'foolish', i opted to employ it as part of the process while reviewing a condor bivio x cyclocross bike (review to follow soon). 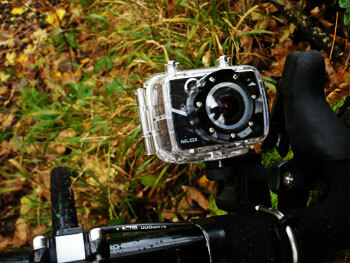 though this amply demonstrates my compete lack of cyclocross abilities, filming from the handlebar bracket, the chest harness and sitting by the wayside on a mini tripod proved rather fun if, as is often the case, a rather lengthy process. the film portrayed below lasts a few seconds longer than two minutes, and took about five hours over two successive saturday mornings to record the raw footage. on both occasions, though filmed in the shelter of bridgend woods, it rained heavily and frequently, none of which phased the camera at all, other than one or two smears of water which can be seen in portions of the movie. if you need ultimate clarity, it's best to place the camera away from direct rain, and make sure you clean the lens front regularly. the colours seem just a tad on the desaturated side, but that could conceivably be due to the low light and grey skies under tree cover. the camera seemed just a bit put out by the relative brightness of the sky, but digital cameras costing several thousand pounds are often hard-pushed to cope with such drastic contrast levels. 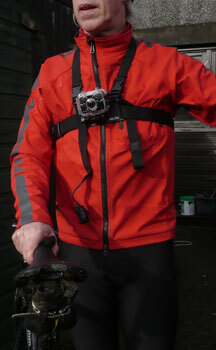 the chest harness, though featuring a removable and adjustable threaded camera mount, suffered from a tendency to point slightly downwards when i'd hoped to show more of where i was heading at the time. the hingeing theoretically allows the camera to be tilted backwards, but in practice, one's body mitigated against achieving total verticality. however, when combining footage from the harness with a forward pointing handlebar bracket, it was possible to achieve appropriate footage. 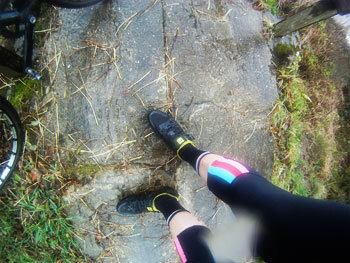 the bar bracket does not fare well over rough ground, being hinged parallel to the straight portion of the bars. though this position can be tightened, it seems impossible to do so sufficiently to prevent the camera eventually tilting onto the bars. this bracket seems very susceptible to road induced vibration; the resultant footage is hardly to be regarded as steady. in the context of the movie displayed below, this was not of great concern, for those sections of the film are mercifully short and are most likely to be so, if viewer interest is to be maintained. 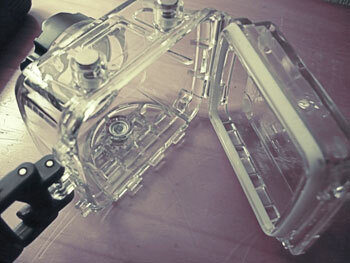 if i had any concerns during filming, it was the possibility of stripping the tripod mount thread in the camera body. continually moving the camera from tripod to harness to bar mount (and possibly any of the other mounts that arrive with the camera) over several filming occasions is bound to increase the possibility of this happening. in the interests of testing the appropriateness of using the 'foolish' in less than favourable conditions (my orange flip camera would have been seriously challenged to complete the movie below) i made no special concessions, carting the camera and all its associated parapernalia in a tweed musette over less than billiard table tracks. though the camera is capable of full 1080 hd, i discovered on uploading to vimeo that unless i subscribe to the pro version, it is downsampled to 720. not being the most sophisticated of spielbergs, i was unable to figure out why the raw footage in apple's final cut express was so much clearer than the end result. though everything is digital, quality was being lost somewhere in the process, and likely a touch more when exported to h.264. sadly, video codecs are not a competent part of my expertise; suffice to say that the footage direct from the camera looked a lot more impressive than that displayed below, acceptable though i think it to be. i don't intend to bust a gut attempting to figure out where i'm going wrong, particularly if vimeo insists on downsampling, though in retrospect, i think it possible that i have the display preferences incorrectly set on final cut. my own requirements of a camera such as the nilox may diiffer greatly from yours, but i think it unlikely that it will not satisfy your demands whatever they might be. 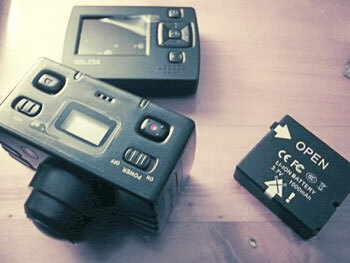 several of the mentioned foibles are likely to affect such a small camera, no matter the brand, and it is eminently possible that familiarity will offer solutions that i will kick myself for not having thought of this time round. apart from the chest harness and bar bracket, all the above can be had for a most reasonable £199.95, always remembering that it also takes particularly high quality still images into the bargain. i see a new career in hollywood beckoning.